Comparison of Wichita Casino Party Providers. Take a look at the roulette image to the left. We try to offer more than this. The image shows a skirted folding table with a roulette cloth substituted for the table cloth. We would rent this setup for $60, you shouldn’t expect to pay more than that. Also note the single player 100-qty chip racks that are used as the chip tray, they need addt’l rack space for “bigs”, high-value chips, for payouts. Here’s what we did: Fabricate a table with a hole cut for the wheel to sit down in the table. Added an armrest and it’s all set! Dealer chip tray sits on the table and big chips are in the lower rack (dealer side). Pls Note: On your proposal or invoice, only Amerifun lists the actual size of Roulette and Craps tables being proposed. The sizes of those tables, and all tables, is imperative in calculating the proper number of PLAYER POSITIONS (spots) per number of guests. 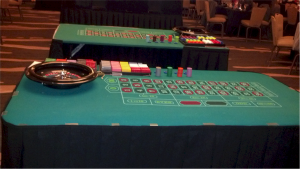 Additionally, simply having a “roulette” or having a “craps” is not enough; you need to know if the table is large enough for your event. For example: You would not want just a lone small six-foot craps or roulette at a party with 200 guests, or even 100 for that matter! This is HUGE, these are by far the busiest games. TIP: A good rule of thumb is to have about 40% Craps & Roulette (and like games) and 40% Blackjack (and the like), along with 10% Poker. We will figure this for you and recommend the proper amount of apt sized games. For larger groups we will recommend like games in addition to the key games mentioned above. We will however provide as few or as many games as you need and do not require a certain amount per number of guests, we only start with a proposal of recommendations. We have been offering casino nights full time since 1997 and are among the pioneers. 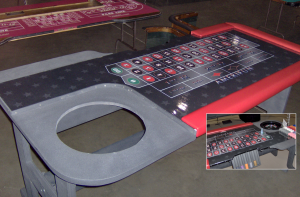 Count on Amerifun to provide experience with a proven refined system and confusion-free format. Fun shouldn’t be hard, you just want to turn the key and go!